I have discovered the best source of knowledge for the future. People over the age of… well I don’t know the exact age, but my Oma (who I refer to as Joanne) is 70 and she qualifies. Last night around the dinner table I asked how you can keep growing parsley and other herbs, because she was saying the coriander went to seed and she had to pull the whole plant out. So I wondered, when transports stops being widely available, the possibility exists of nurseries not keeping seedlings for us to conveniently go and buy a new coriander or parsley plant. So how does one propagate that plant. The answer for parsley is that when it goes to seed, then seeds grow (no way!) and you can collect them and then grow then, but you would need a bit of a glasshouse. She also reckoned that if you just leave the parsley to go to seed then the seed fall on the ground and grow into new plants. That being said, she has a parsley plant that has been going strongly for 3 or so years because she keeps trimming it back. So I figure you need two sets of plants, the ones you are growing for seeds, and the ones you are growing to eat. Because we also talked about carrots, and how Joanne planted carrots from seed as a kid (although mum said that is the best way when she was over the other day). We guessed that if you leave your carrots to grow long enough then the stalks must produce seeds. Again, you would need to have digging-up carrots, and seed-growing carrots. Probably all this information could have been read on the internet or from a younger gardener. But I like it when information comes from a person. Then this morning we were talking about showers and she told me how when she was a kid they used to have a bath once a week, cos the bath water had to be heated up using a bath-heater.. Then when she was about 12 her mother told her she would have to start having showers everyday, so she used to go out and chop kindling with a little tomahawk (eat your heart out Lenore) and heat up enough water for her shower. That amazed me, because I forget (or don’t realise) how she lived in a time before many of the amenities that we have today, especially as she grew up in the country. 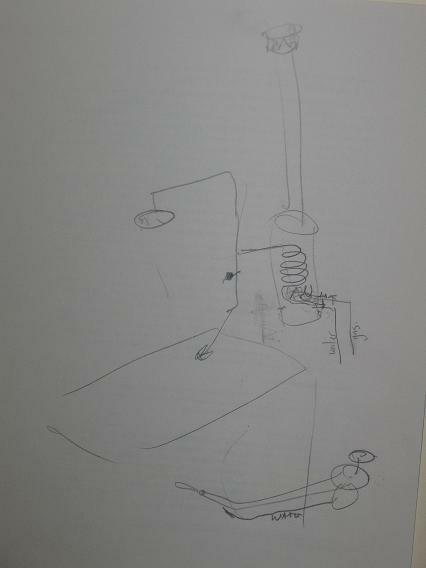 Okay, I just asked my Opa if he had to heat the water for his bath, and he drew me a picture of what they used as a bath/shower heater. What he explained to me doesn’t involve wood, but gas and, of course, water. He says the gas couldn’t be turned on without turning on the water. and that it heated the water up then there was a tap that meant you could either fill up the bath, or direct the water up to the shower-head. I guess there isn’t too much choice about how hot you have your water. I hope to continue learning valuable information out of them for the future. I thought it would be good to catalogue it here, otherwise I will forget.